THE PSNI investigation into the murder of father-of-two Conor McKee is focusing on a crime gang linked to at least one other killing. The gang, who are known to be heavily involved in the heroin trade and have been linked to a string of violent attacks, are the focus of the inquiry and the North Belfast News understands no other leads are being followed at this point. 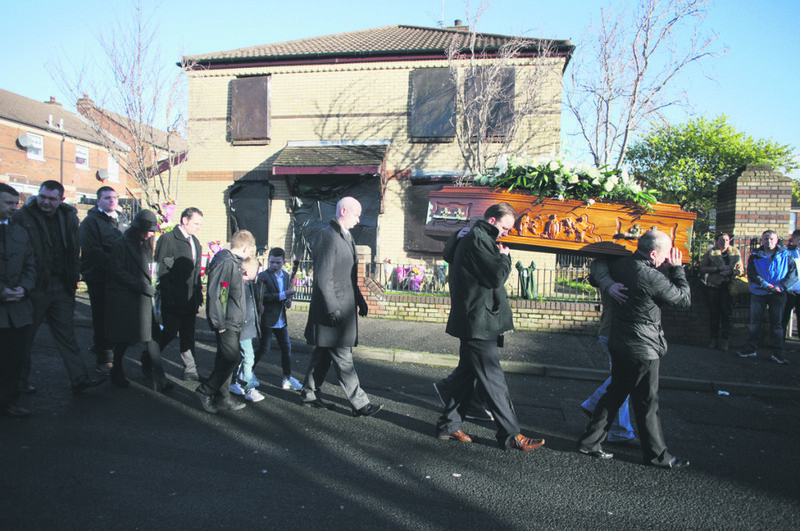 Mr McKee, 31, was murdered last Thursday evening (January 7) at his home in Glenpark Street. It was at first thought that he had been stabbed to death. However, a post-mortem found he suffered a number of gunshot wounds. Two men arrested for the murder were later released on police bail pending further enquiries. Hundreds of people turned out on Thursday morning for the Oldpark man’s funeral at Sacred Heart church, just yards from where he was killed. Mr McKee, who is from a highly respected family, had been struggling with a heroin addiction at the time of his death and was on bail for drugs related offences. The murder was described by investigating officer Detective Chief Inspector Justyn Galloway as being “particularly brutal”. He said police had already received a lot of cooperation from local people after an appeal for information. “We have had a very positive response from Conor’s friends who have come forward with information after our appeal last week. I want to thank them for their co-operation. “We also appealed to a person who phoned police in the early hours of last Friday morning with information about the murder to call back. That person has yet to do so. I would appeal to them to contact us. “Our enquiries in the local community have established that Conor was seen in the area of Rosapenna Street and Oldpark Road at 6pm last Thursday evening. We believe he was shot in his home at Glenpark Street at 6.15pm. “I am appealing to anyone who saw Conor walking from the Oldpark area back to Glenpark Street between 6pm and 6.15pm, either on his own or with someone, to contact us.